← BOOKMAKERS ARE PROBABLY QUOTING FAVORABLE ODDS ON FRANCIS THE MERCIFUL CHOOSING ARCHBISHOP GREGORY MICHAEL AYMOND, ARCHBISHOP OF New Orleans TO SUCCEED CARDINAL DONALD WUERL AS THE NEXT ARCHBISHOP OF WASHINGTON, D.C.
JEWS BUILD AN ALTAR TO BE USED IN THE THIRD TEMPLE FOR ANIMAL SACRIFICES TO GOD. 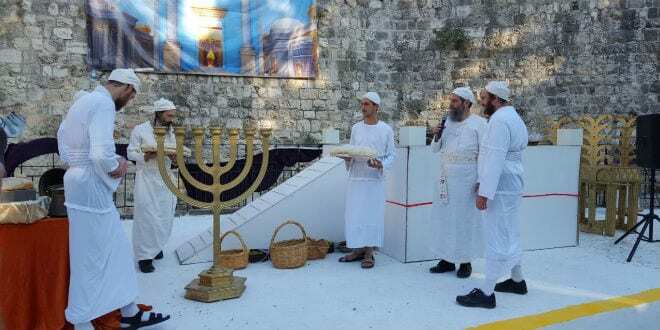 5 Responses to JEWS BUILD AN ALTAR TO BE USED IN THE THIRD TEMPLE FOR ANIMAL SACRIFICES TO GOD. WOW! Thank you, Your Excellency. Astounding information! Maybe they won’t be able to finish the job. Christ said “there shall not be left here…” It is scary tho. Very much so. My understanding is that the Jews are expecting the Messiah to come. Instead it will be the anti christ. Is that right, Bishop Gracida? Thank you so much. Does this mean that the end really is near?